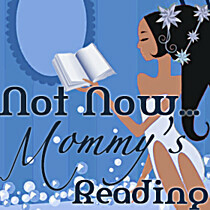 About meNot Now…Mommy’s Reading is a book review site hosted by two best friends who share a passion for reading. Although we love to read and discuss the books that we’ve read, our tastes run quite differently. From erotica to horror to thrillers to urban fantasy to romances of all kinds – it’s a rare thing indeed when we find a book we can actually agree on. However, we can both agree that indulging our passion can be a chore with families, friends, work, school, and other “real life issues” pulling us in different directions.